Hugs and Holly by Red Rooster. Purchase 1/2 yard of each fabric in collection. Cut in store. 1/2 yard collection does not include panels. Kelly’s first holiday collection! These fabrics are simply fun! Kelly has designed an innovative craft panel to make gift making fun and easy. This panel is truly different from any other as it offers the main fabric and instructions for a variety of gift-giving items such as a dish cozy, hot pad, goody bag, coasters, beverage bag and soft bucket. Just follow instructions on the panel and add coordinate prints to turn these motifs into finished gifts in no time at all! bric baskets, garland and definitely quilts can all be made that much more fun by using these charming prints! The text and tonal snowflake prints are just fabulous! 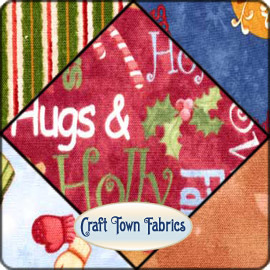 Plus, they will work beautifully with many other holiday fabrics in the marketplace today. 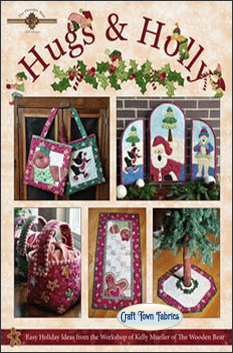 Hugs & Holly Book: Collection of simple holiday projects to decorate your home or give as gifts. Some of the projects include a table runner, pillows, bags, skirts for small Christmas trees, goody bags, dish cozies designed for 8in square pans, and more. This entry was posted on Monday, May 28th, 2012 at 1:00 am and is filed under Uncategorized. You can follow any responses to this entry through the RSS 2.0 feed. You can leave a response, or trackback from your own site.